The Randall B. Terry, Jr. Companion Animal Veterinary Medical Center in building number 1052. Clients may park immediately in front of the Terry Center as shown in purple on the map. The Veterinary Health and Wellness Center and the Equine and Farm Animal Veterinary Center is located in building number 1060. Clients may park in front of those facilities as noted. Additional parking is available as noted with a C permit or a visitor’s parking permit, which can be obtained from the receptionist in the main CVM Administration Building. 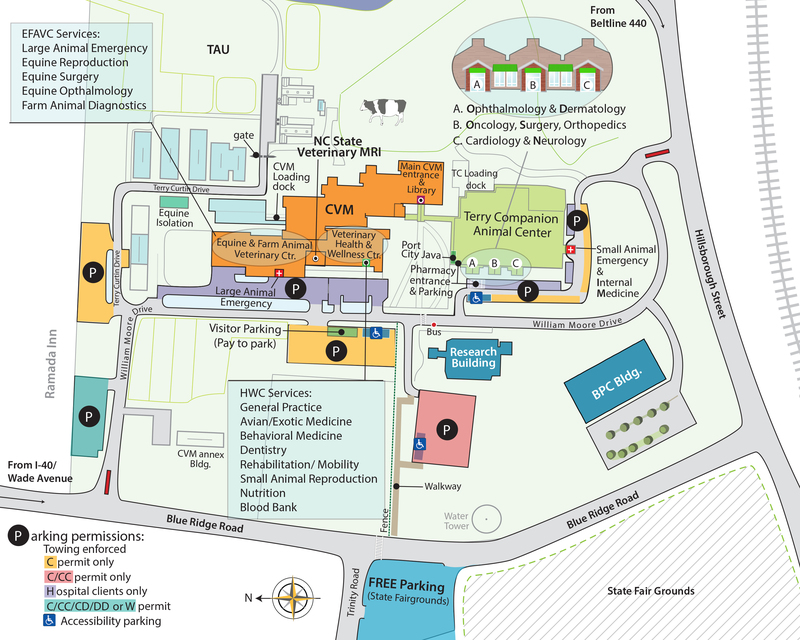 Take the NC 54/ Hillsborough Exit #3 and turn right at end of exit onto Hillsborough St.
Hospital clients should follow signs for Terry Center, Health and Wellness Center or Equine and Farm Animal Center and park in lot in front of that hospital entrance. All other visitors should park in one of the marked visitor spaces (darker green on the map above) in the C permit parking lot across from the hospital. Visitors must then obtain a temporary daily permit from the College receptionist inside the main CVM entrance. Take exit #3 Hillsborough St. and turn right at end of exit onto Hillsborough St.
I-40 East to exit 289, Wade Ave.